All 9 Training Secret DVDs only $59.99! 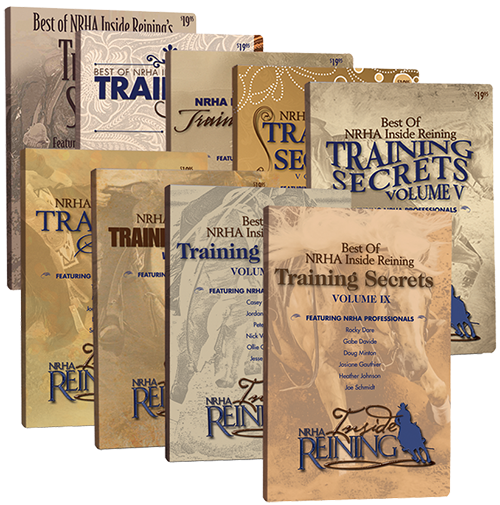 9 volumes of training tips from NRHA Professionals including Shawn Flarida, Craig Schmersal, Tim McQuay, Dell Hendricks, Craig Sommers, Mike McEntire, Tom McCutcheon, Todd Crawford, Jordan Larson, and more. FREE SHIPPING with a purchase of 3 DVD's or more in the Continental US. Also Available: DIGITAL DOWNLOADS - click here to download videos directly to your computer, phone, or tablet! Just $19.99 per title for unlimited downloads.